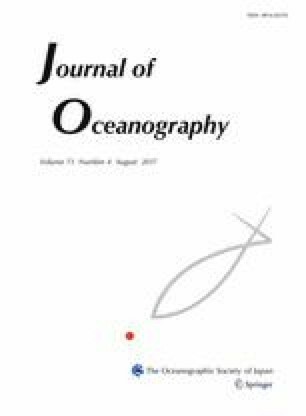 The relationships between the spatiotemporal variation in phytoplankton community structure and environmental variables were investigated in the Kuroshio Extension (KE) region from winter to spring by analysing biomarker pigments. In winter, when the mixed layer was deep, phytoplankton communities were characterised by low biomass and a relatively high dominance of cryptophytes, followed by chlorophytes and pelagophytes. In spring, phytoplankton biomass generally increased with shoaling of the mixed layer. In April, when nitrate was not exhausted, chlorophytes became the most dominant group throughout the KE region, followed by cryptophytes. In May, in the south of the KE, phytoplankton biomass decreased with the depletion of nitrate and cyanobacteria dominated, whereas at the northern edge of the KE, phytoplankton biomass remained high. A predominance of diatoms occurred sporadically at the northern edge of the first ridge with a shallow mixed layer and an elevated nutricline. In contrast, the contribution of diatoms was low at the northern edge of the second ridge, despite high levels of nitrate and silicic acid, suggesting that factors other than macronutrient depletion limited diatom production. In general, the contribution of diatoms to the total phytoplankton biomass in the KE region was small in both winter (2.9%) and spring (16%). This study showed that the phytoplankton communities in the KE region during the spring bloom were generally composed of non-diatom phytoplankton groups, chlorophytes, cryptophytes, and prasinophytes. It is necessary to identify the roles of non-diatoms in grazing food chains to more accurately evaluate the KE as a nursery area for pelagic fish. The online version of this article (doi: 10.1007/s10872-017-0415-3) contains supplementary material, which is available to authorized users. We thank the captains, crews, and scientists on board the cruises of the R/V Wakataka-Maru, R/V Shoyo-Maru, R/V Hakuho-Maru, and R/V Tansei-Maru for their cooperation at sea. We also thank Dr. M. Nakamachi and Dr. T. Ikeya for nutrient data, and Dr. X. Liu and Dr. M. Iwataki for their helpful suggestions regarding the pigment analysis. This study was financially supported by the grant “Studies on Prediction and Application of Fish Species Alternation” (SUPRFISH) from the Research Development of Agriculture, Forestry, and Fisheries Research Council as well as a MEXT grant (24121005).